Will it burn longer than 14 hours? The answer is yes. Historically we've been conservative in stating the length of burn time for all of our woodstoves, to account for varying wood quality and user inexperience. An experienced woodburner with quality seasoned hardwood will be able to achieve longer burns. One of our beta testers, Brian in PA, knows what he's doing and has been experimenting with ultra long burns. Below are his pictures and videos showing the stove throughout a 24 hour long burn! If you are interested in seeing Brian's full postings about his 24 hour long test burn, please visit the Firewood Hoarders Forum, where he's been keeping an in depth log. Below is a picture of Brian's fuel load for the 24 hour burn, and four very short videos taken at 10 hours, 17 hours, 19.5 hours and 21 hours. This link has a detailed discussion of his long burn. with lengths ranging from 8"-14". What stove top temps through-out ? 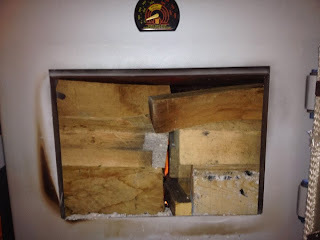 If you visit the link for the Firewood Hoarders Forum in the blog posting, you'll see Brian's detailed postings and temperature readings during different stages of the burn.